Thank you for all your lovely flower tutorials. I’m currently in the process of making these to take to my mom’s grave. I’m putting them on a skewer so i can stick into the dirt. They will last and are beautiful. Tulips for spring & with the many tutorial you have I’m sure I can find a flower for each season. Hi Lia! Love all of your crepe paper tutorials! 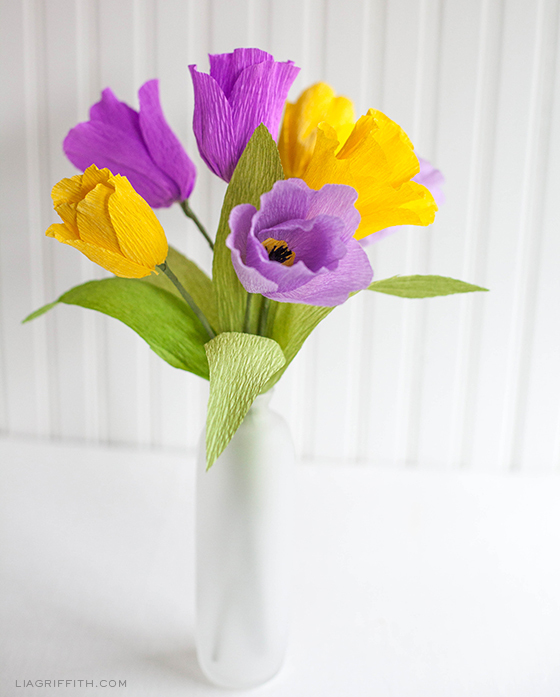 I’m making ranunculus, roses, gardenias, and these tulips for my wedding! I’m having a little trouble with the tulips though. I’m finding it difficult to bunch the bottom of the petals and fold them up. Any way you could make a video tutorial for this one? 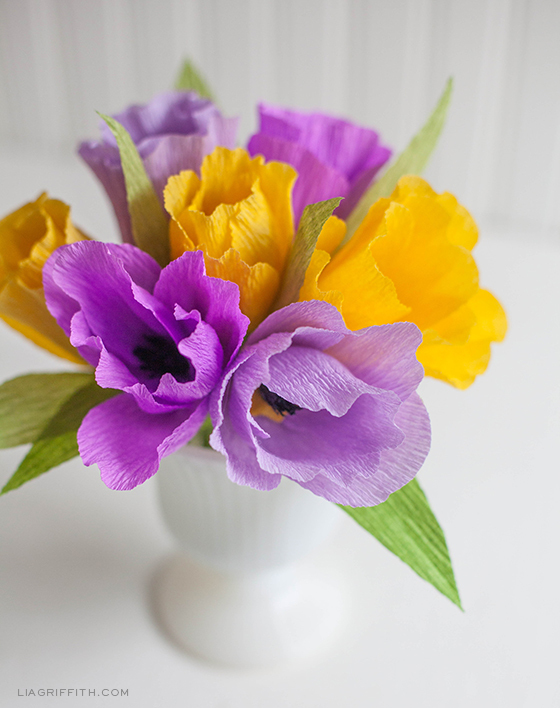 We are starting a full tutorial series on crepe paper flowers starting in late May. Stay tuned! 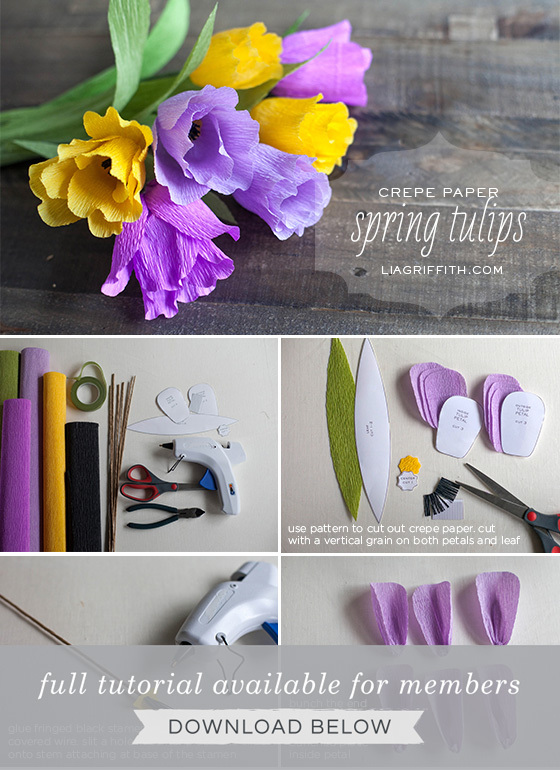 It’s such a nice idea by using papers and making them flowers..good job! These are fun and easy to make for sure! 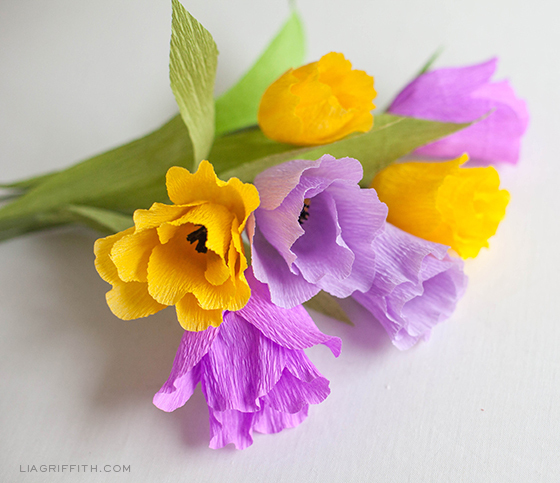 These are so pretty, can do in so many colors and crepe paper is available in so many colors. You make it look easy and doable. I just have to decide which flower I’m going to do, guess that will depend on what paper I have to make them with. I’ll have to take good look at crepe paper rolls I get at $tree, might not be heavy enough and rolls aren’t wide enuf to make leaves. I’m dying to try these out, they look just lovely! I linked you on my blog so that I don’t forget! I plan to use your design at the nursing home where I volunteer to teach arts and crafts. Because the home is faith based I’m not allowed to use anything “Easter bunny-ish.” This is PERFECT. Thank you for a wonderful idea! This will be perfect for that! So beautiful Lia, it’s going to my pinterest, and one of these days I’m going to try and make it. Do! I think you will love how they turn out. 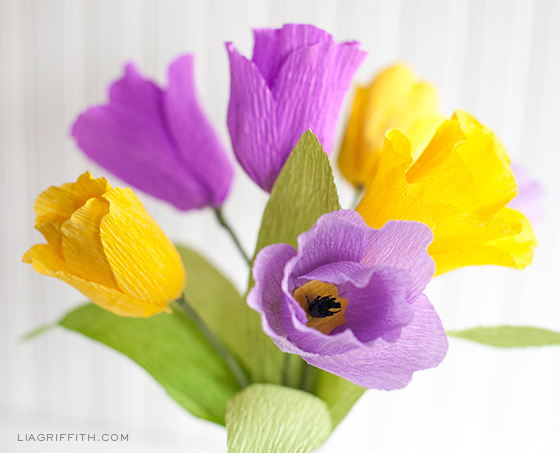 Beautiful tulips with crepe paper. I invite you to me on your blog. I make flowers out of tissue paper and crepe paper too. Greetings from PolandBeautifull. Thanks for the link! Your flowers are just lovely. As usual these are lovely Lia, will have a go at these the weekend. Thanks Pearl! They are really fun to make. Well, I love all your ideas and projects, but your flowers are simply the best!!! One of these days my house is full with your flowers :). Aww, thank Cris! I will just have to keep making new ones for you all. I just have to love your paper flowers!!! Crepe, card stock, paper stock, it doesn’t matter, they are just amazing! Amazing!!! I will try these for sure! Thanks a lot, Lia! Your tulips are amazing! I believe you could make anything out of paper! I have a ladies brunch coming up in a few weeks. I will definitely be trying these! Tank you very much!! Perfect for that! They are going to love them.